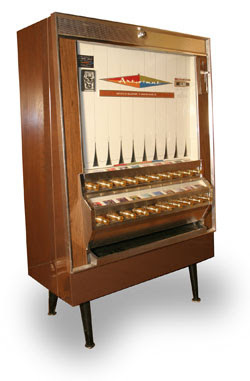 My dig of the week: Art-O-Mat. It's rehabbed vintage cigarette vending machines that dispense tiny pieces of art. Mostly it seems they are located in museums, but when Hillary and I live in our warehouse that will have a coffee/book shop in the front of it, we're totally getting one. In the mean time I'm headed over to MOCA for some bite sized art. Yesterday was slotted as my evening for writing but I got smashed into by a BMW 5 Series and therefore, stayed huddled on my couch with pizza and beer watching a Metallica documentary with Hill, trying not to remember my cute little, starlight blue, Matrix up on the sidewalk with a broken axle.